Ironman is a stupid enough way to spend a day at the best of times – so racing Zurich four weeks after my Fast-But-Not-Quite-Fast-Enough 9:05 at Austria was always going to be ‘interesting’ and the range of possible outcomes was rather wide – from a tiny chance of a better race than Austria to a far higher chance of it being calamitous. But as I wanted to be in Kona again this year, especially with James going for a once in a lifetime trip, it was a risk I just had to take. The physical response would take care of itself and my body would give me whatever it had on the day – I was fairly relaxed about that. I seemed to recover pretty well with 1.5 weeks super easy, 1.5 weeks of moderate training and then my normal race week. Swimming felt great, biking about normal and running was 50-50, as you’d expect. But I did two things differently – I didn’t go out drinking quite as enthusiastically as normal after an Ironman, and I did a lot of light and short swim and bike training in that first 10 days, which I’ve never done before. Keeping your body moving really does speed recovery. It hurts but it’s worth it. What I was more concerned about was the mental side and how to deal with the voices that would be screaming ‘you raced one of these ridiculous races four weeks ago – you’re bound to be rubbish’ as soon as things got hard on the run – which they inevitably would as 1) it’s an Ironman – it always gets hard on the run; and 2) there’s no getting away from the fact that I did indeed race one four weeks before. The course at Zurich is about 15 minutes slower than Austria and prior year results suggested a good performance (9:15-9:25) might be a podium in my age group – but they increased it to 65 Kona slots given it was the 20th anniversary. On the one hand this was great as it meant nine slots in my age group (vs. the paltry four at Austria), but on the flip side it was foolish to think other slot chasers hadn’t also then come flocking to make this a far more competitive race at the sharp end. Even so, I thought that anything under 9:30 would be very unlucky to miss out. To add to the fun and games, I did the trip with my mate Will Newbery who had missed out at Ironman France and was also slot hunting in the same age group. On paper we’re pretty similar with my 10-15 minute faster bike being cancelled out by his 10-15 minute faster run. But it would be friendly fire (despite the appalling pre-race banter) as there were plenty of slots for both of us, and it would be great to have a benchmark on the course. We also had Nico out in support as a roving reporter giving us age group placings on the course thanks to info from friends tracking online. Zurich is a great course with a normal one lap lake swim and four lap town run but the jewel in the crown was an absolute belter of a bike leg. Two laps with 45k of pancake flat TT riding and 45k of hills with both long dragging 4-10% climbs and very steep, technical descents. 1700m climbing and the profile of the descents means it’s a slow course – whilst any goon can fly down the long, straight Austria descents (especially when wedged in a peloton), Zurich rewards risk takers, good bike handlers and good aerodynamics. When we drove the course with my friend Kai who lives in Zurich I was really excited as it suits my riding and didn’t look conducive to drafting groups forming. 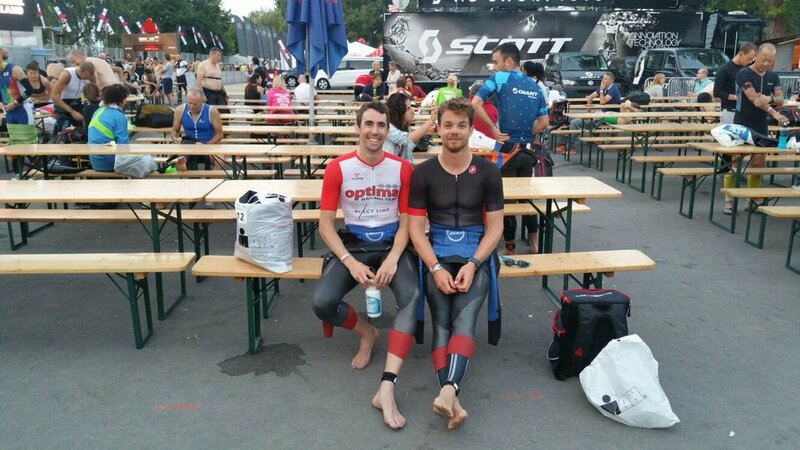 Just as I had done at Austria, Will and I went on the front line of the rolling swim start with Alex Bradley (Team Freespeed’s new 21-year old sub-9 guy) – but I just wasn’t firing in the water, couldn’t hold Will’s feet and swum a disappointing 59 minutes (turns out it was near 4k, but even so I should be faster), with Nico telling me Will was two minutes up the road. Thankfully my bike legs felt good from the off. I caught Alex at maybe 10k and encouraged him to come with me and then found Will at about 20k, who I absolutely didn’t encourage to come with me seeing as he has a 3:02 run in his locker. It took two 350w+ attacks (I was suitably impressed/concerned when Will came back at me after the first) but I managed to get away and then reached the hills with three strong looking riders - Alex had chosen not to come, which I thought boded well for his race. This group stayed together nicely in the hills but, as expected, fell apart back on the flats with most of them having ridden too hard and I set about getting as close to the front of the race as possible on the second lap seeing as I still felt great. I was enjoying one of my best Ironman rides, loving the course (including hitting 89kmh on one of the descents – squeaky bum time!) and there was barely a soul out there. So I was, frankly, pretty pissed off to learn from Kai at 150k that there were maybe 20 age groupers ahead of me – I thought I’d be way higher up than that. So I knew then the slot-hunters had indeed turned out in numbers and this was going to be a harder day than hoped. At least this time I knew that everyone at the sharp end would be doing the run on tired legs as the bike course was both tough and better refereed than Austria. I came off the bike in 4:59, about what I was hoping and the poor swim was long forgotten. Before the race I was expecting to be well in the mix at T2 and was hoping my run legs were something like Austria (3:15-3:20) so that a top-9 place and a slot would be safe – but that if I hadn’t recovered and they weren’t good then I was prepared to fight and scrap for the c.3:30 run that should see me grab one of the last slots. I ran out of T2 feeling alright. Not great but not bad. Yet again I started running too fast with the first 4k at 3:05 marathon pace – I managed to slow myself down before my body did it for me and then my body gave me my pace for the day – which was about 4:45s (3:20 marathon pace). I reached the end of lap one of four in 47:30, and Nico told me I was 5th in AG after the bike – I was disappointed not to be higher, but was well into the top-9 so I had the buffer I needed, I was feeling great and a sensible run should be safe. Also, no sign of Will at the out and back section where you see anyone within eight minutes of you. Alex was four minutes back, looking good. Only that didn’t last long. On lap two the gorilla threatened to jump on my back – I didn’t slow much but it just felt way harder than lap one. Just as this was happening Nico told me I had fallen to 9th in AG after lap one – despite running well. WTF?? Right then… cue the voices… cue the mental fight/negotiation. Now it was hot. Surely if I was struggling at an unsustainable feeling 4:45-50s now the second half would be a car crash? Surely easing off to a 3:30 marathon would be safe? Surely this can’t be another race with loads of age groupers running sub-3? Then I saw Will – he was eight minutes behind me. You know that comment earlier that there was plenty of space in the Kona slots for the both of us? At that moment I knew that most likely wasn’t the case. In my head I was racing Will for the last slot – and he the same. At eight minutes back with 24k to go my mental arithmetic told me it would be bloody close, and he was motoring. Lap two in 50:38. Scores on the doors: 34th overall out of 1600, 32nd male, 8th in M35-39 (I got someone in the last 5k) and 1st Brit. And most importantly Kona ticket stamped. Much like Austria I don’t think I could have got to the line any faster. Given I felt significantly worse than on the run at Austria (3:14), I’m delighted with keeping my body and head together for a 3:21 marathon. I suspect my slower run here was as much to do with a proper bike ride on a tough course (I spent the last 90 minutes at Austria twiddling my thumbs 12m off the back of a peloton) as having Austria in my legs. This time on a level playing field my slower run moved me up from 45th at T2 to 34th at the finish. It’s possibly my best Ironman to date given what had come before and the pressure I’d put on myself to deliver a Kona slot. I was hoping not to need to scrap for a slot, but I did and got it done. Zurich is a terrific course and race, made even better by racing with Will and having amazing support from Kai and Nico. Whilst it doesn’t quite have the support and impact of huge races like Austria or Frankfurt, with slick Swiss organisation and a tougher bike course it was certainly a fairer and more enjoyable race for me. The only negative is that Zurich is an astonishingly expensive place to visit - £35 for a burger and beer anyone? Whilst my Hawaii slot was in the bag, the rolldown was a case of biting our fingernails to see if Will, who finished 11th(with 10th just one second ahead! ), was going to be joining me. I know exactly what a horrible morning he had. Given the number of slot chasers who had so obviously turned out, it was doubtful… but I had a sneaky feeling that Madame Pele might be looking out for him given he passed on a slot last year and that he’s done his time. When the guy in 7th joined the guy in 4th in declining there were tears and hugs for the second time that weekend. 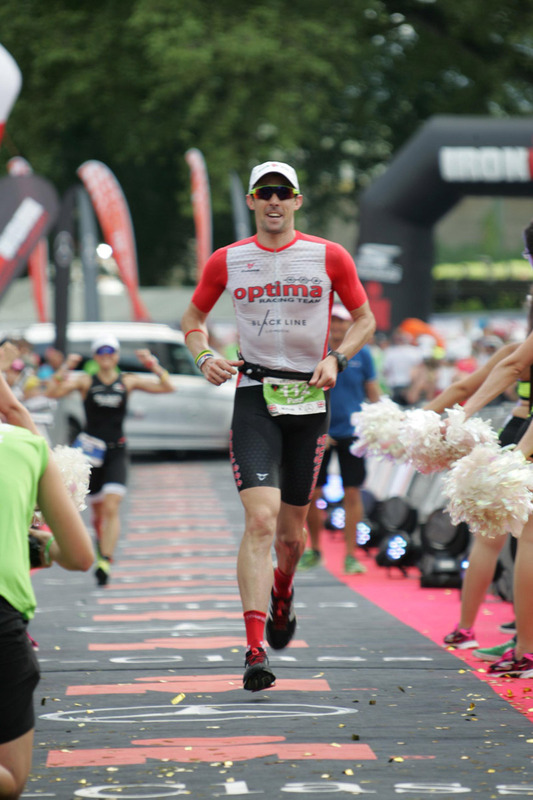 I’m not sure I’d recommend back to back Ironmans, but it was an amazing weekend and after 11 Ironmans I continue to learn more about myself and my body – I think the long, consistent winter’s prep with the Optima short course guys was the reason I was able to back up Austria so solidly. Time for a bit of a break before building up for Kona now. This time I go with expectations for myself and the pressure that brings. It’s truly a stupid sport. But a magical one. We’re all hooked. Roll on October. Kona Baby. Article by Paul Burton - the article first appeared here on optimaracingteam.com.